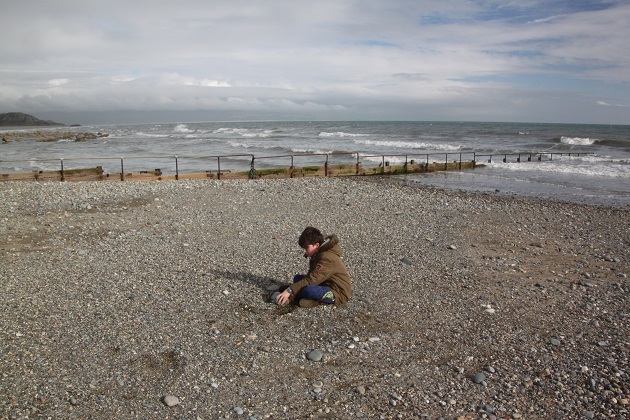 Finally finally the sun decided to put in a (long overdue) appearance on our Wales trip – unsure how long it would stick around we were up and ready to make the most of it. 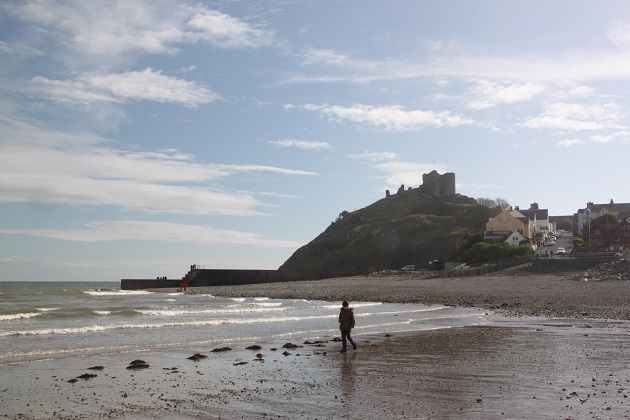 A short drive from Porthmadog and we found ourselves in the gorgeous little seaside resort of Criccieth – a ruined castle on a hill, quaint streets and a pebbly beach – what more could you need. We had a walk around and then made straight for that beach. The sun was still shining, but this is Wales and coats and layers were still necessary – better than being soaked through though. We strolled and explored, Son adored it here and found no end of treasures. Interesting pebbles for his “collection” but a dead eel and some jellyfish were probably the biggest hits. Gorgeous views of the hills in the distance and the beach all to ourselves made it just perfect. On the drive back to Porthmadog we found a narrow country road – barely more than a track, took it and were surrounded by rolling fields, sheep, lambs and stone walls. 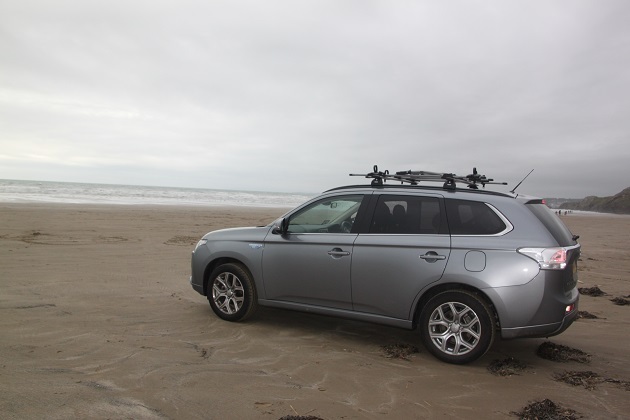 At the end of the road was another glorious beach – Black Rock Sands and quite the novelty for us, you could drive your car right onto the sand. A vast place, lots of kite flying going on but our favourite thing here was the rock pools. 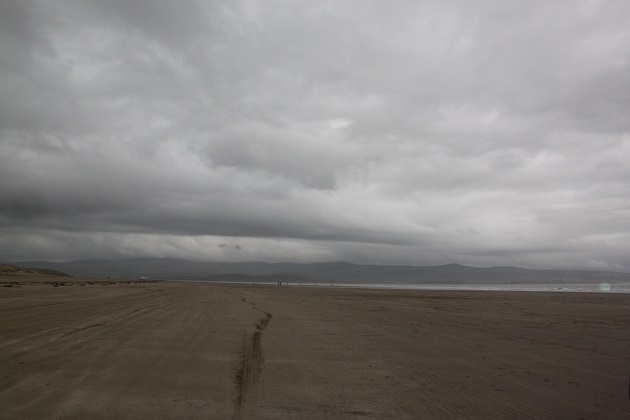 We drove for quite a way along the sand – avoiding the sea unlike one mad driver – and loved the magnificent views. TE Lawrence of Lawrence of Arabia fame apparently lived nearby and the 14th century poet Shelley is reputed to have regularly visited – I can totally see why. 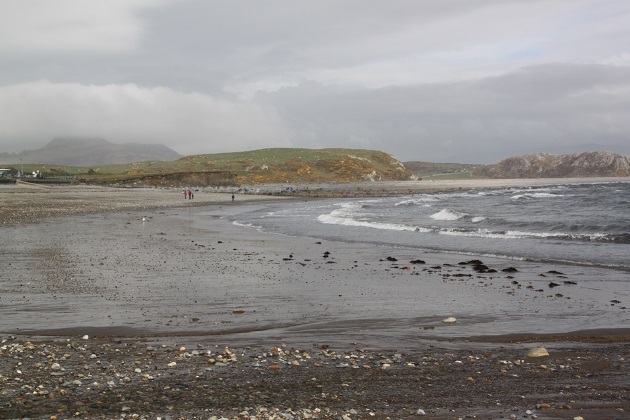 Lovely photos of the beach! It was a fun place to explore and a lovely setting! So pleased you enjoyed a day of sunshine after all that rain. The beach looks very inviting and it must have been fun to park on the beach, but that other car was taking a risk. 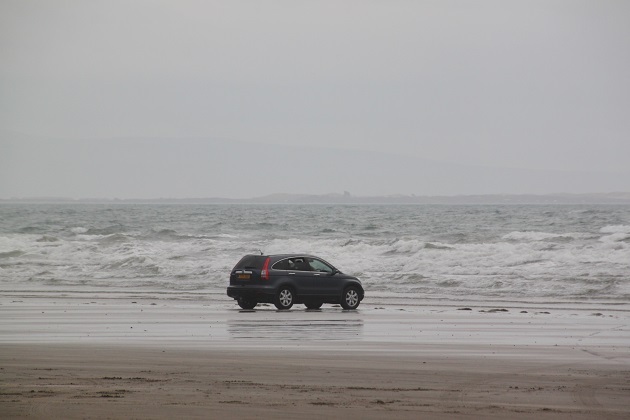 I can remember parking on the beach at Southport as the tide is always miles out there! That’s kind of a standing joke with us – we’ve been to Southport so many times but never seen the sea!! I know, it’s unbelievable they built the promenade so far back, you really do need binoculars to catch sight of it! A mad driver I think!! I’ve been to Nantucket but when I was a student and so long ago now!! 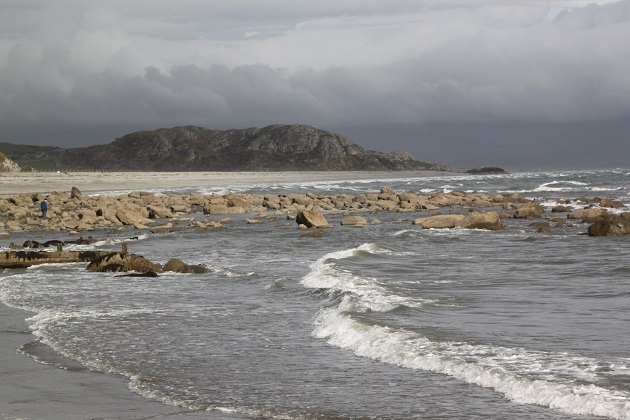 I loved it there – the weather here was nowhere near as good but we did enjoy the beach. At long last Pam the sun did make its appearance and we were so grateful!! The beach here was great, not for soaking up the sun or relaxing but perfect for exploring and finding treasures!! Wonder if the mad driver had a car that could swim? That is crazy close to the water! Too close for me that’s for sure!! Love the place names around there. 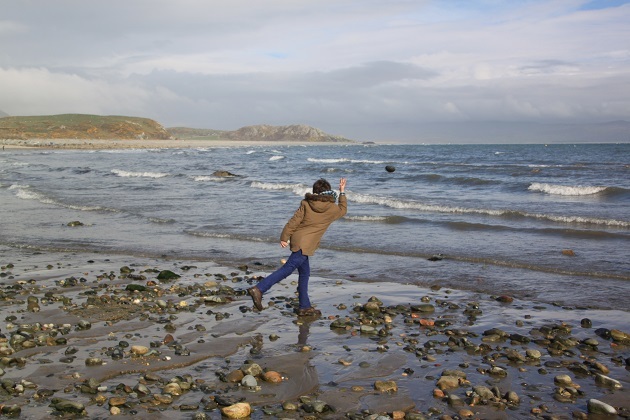 Have you been watching Hinterland on BBC4/iplayer? Worth a look! No not seen that but will be checking it out – thanks!! By coincidence I went there just last week. Fabulous sunshine. Did you go to nearby Llanystumdyw and the grave of David Lloyd George? I wouldn’t have taken my car that close to the shoreline that’s for sure! We didn’t unfortunately – time constraints and all that. We weren’t really even planning to go here, but when the sun came out we legged it to the car and headed for the beach. Need to go back again, would like to visit Lloyd George’s grave and more of the area. Gorgeous photos, Joy and such interesting names of the towns. The stories behind those names must be interesting. Absolutely George – this one I did know how to pronounce, most of them…. well not so sure!! Great photos, looks like a wonderful day at the beach! I still haven’t made it to a proper UK beach yet, but I’ve heard Wales is the way to go. The beaches here were mostly pebbly and not really golden sand – we like that though!! They have spectacular beaches on the Gower Peninsula if you like miles of golden sand. Love that you could drive on the beach, awesome! Glad the sun came out! The sun just made our day!! Thank you so much Antonio!! It’s a real gem of a place Rosemary – we didn’t know it at all but decided to take a drive out because the sun was shining – so glad we did, the beach was wonderful for strolling and such lovely views. We’re still shivering here in the UK, went to a Somme commemoration concert last night but had to leave early, it was so cold!! Hope your weather is better!! So sorry to hear about your mum Rosemary, I know it must be incredibly difficult at tough times like that to be so far away, you feel so helpless. My mum became ill last summer and sadly passed away, we are nowhere near as far as you but it still felt so hard not being there all the time. 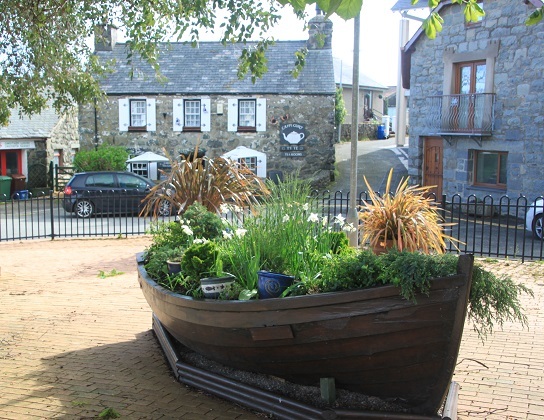 We are keeping our fingers crossed for summer to come back too – not happening yet though!! Stunning photos. What a view! I’m glad the sun came our for you even though it was still chilly. Although I do love being on the beach all wrapped up! 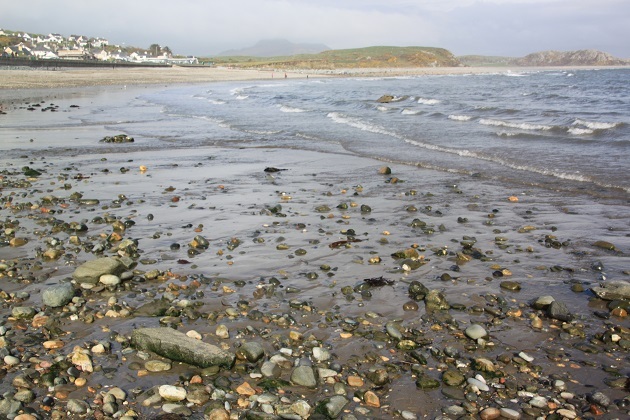 I’ve never been to this part of Wales… Criccieth looks wonderful. 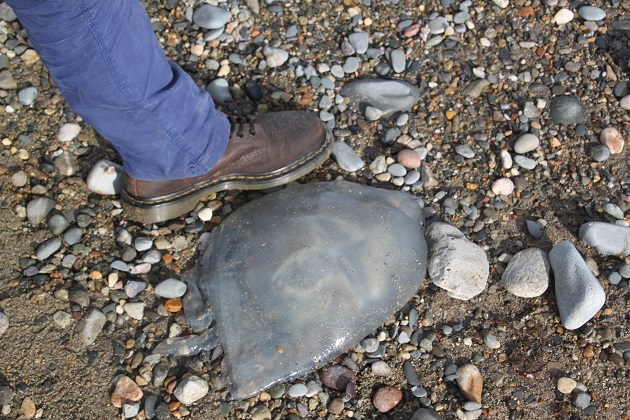 It is a gorgeous little place – the beach is just perfect for exploring and finding treasures!! I know what you mean about being wrapped up at the beach too – it’s fun. I love that area. Special childhood memories. It’s gorgeous – we had a great time there.